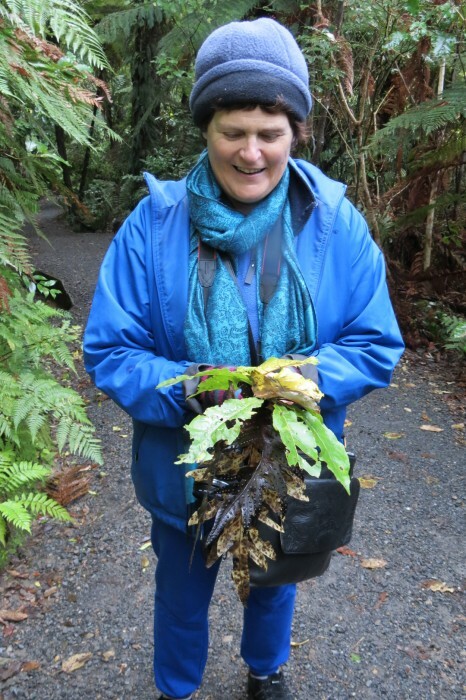 If you’ve been following my New Zealand blog posts, you’ve seen the images of Marion Manson collecting leaves. 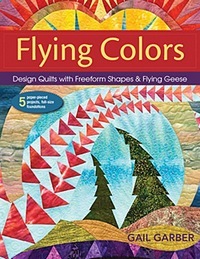 Marion and I became friends back in the early 1990s when she ordered a pattern from me. It was the very first time that anyone from overseas had ordered a pattern from me. I was so thrilled that I wrote to her and then she wrote back. We became pen pals. And, it was Marion, one of the conveners of the 1997 New Zealand Quilt Symposium, who made it possible for me to teach in my very first overseas venue. 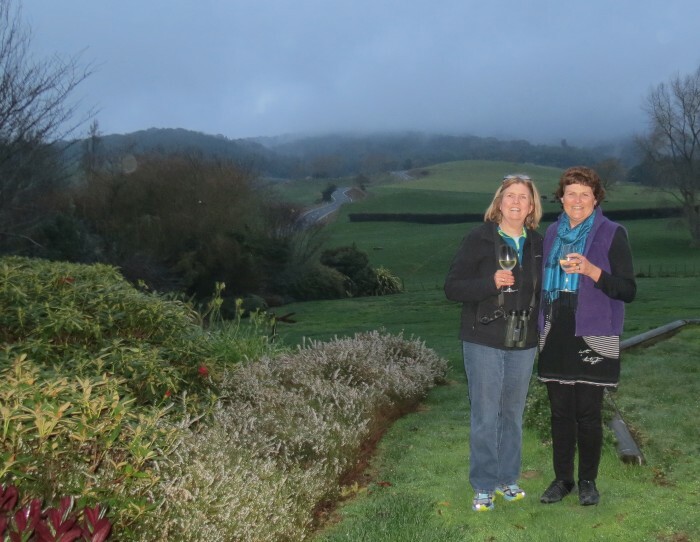 We have remained friends throughout the years and I love to visit her, and husband Kerry each time I return to New Zealand. 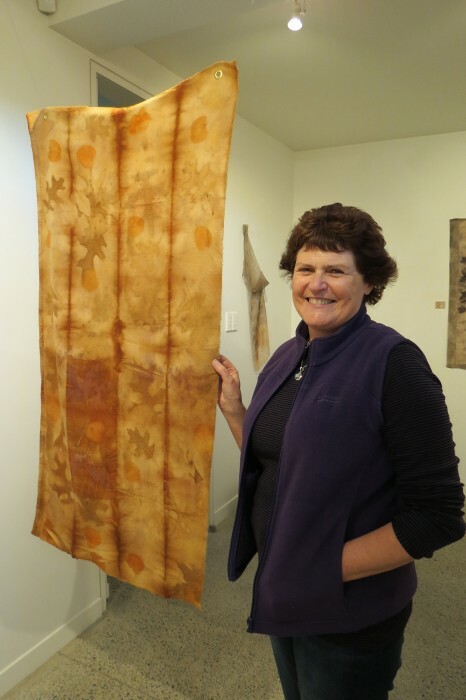 In recent years, Marion’s passion for quilting has evolved into creating her own textiles, using natural dyes and tannins from the foliage of different plants. 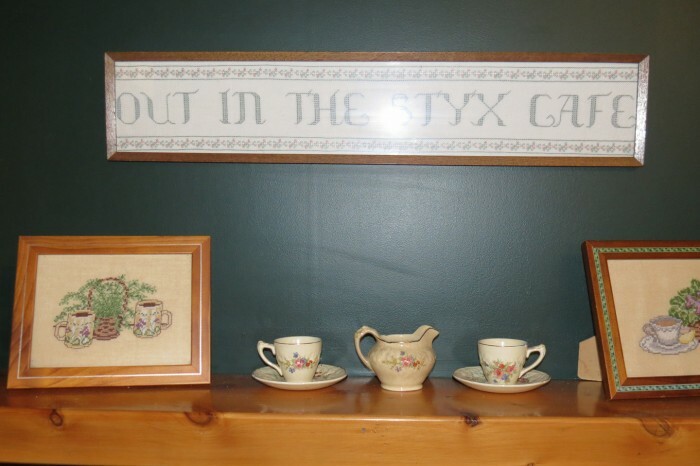 Her back yard and garage are full of various pots with bundles of fiber carefully wrapped around different types of leaves, each of which creates different colors and shapes on her fabrics. 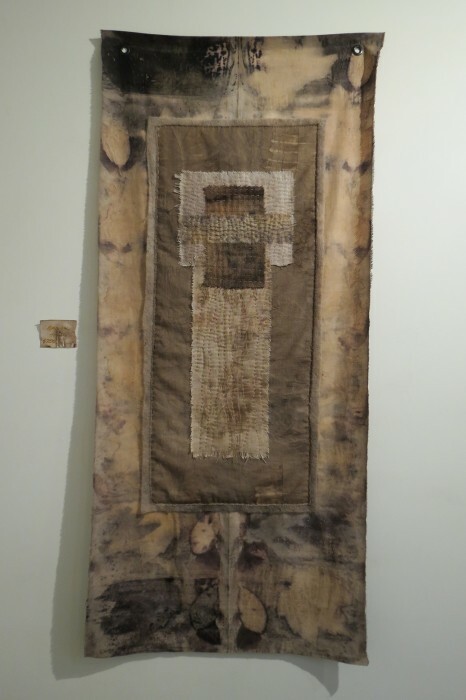 She had an exhibit of her works at a gallery in Hamilton during my visit where I was able to see many of her beautiful designs, both garments like the shawl above, and wall hangings. 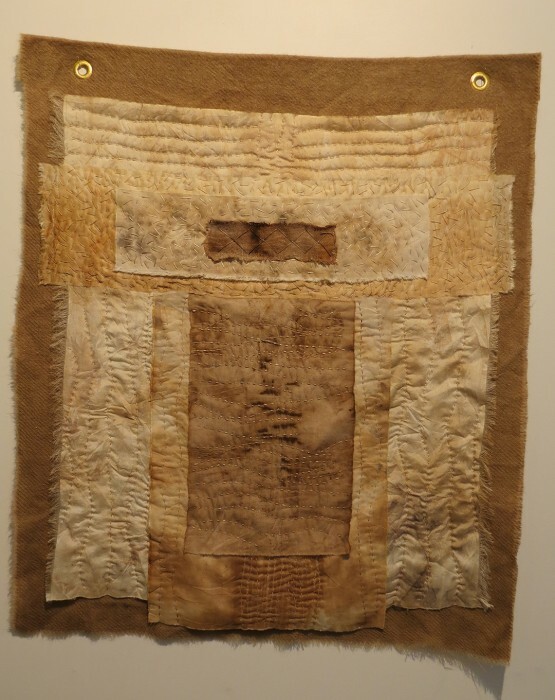 I love the delicate fibers and subtle texture in her layered works. 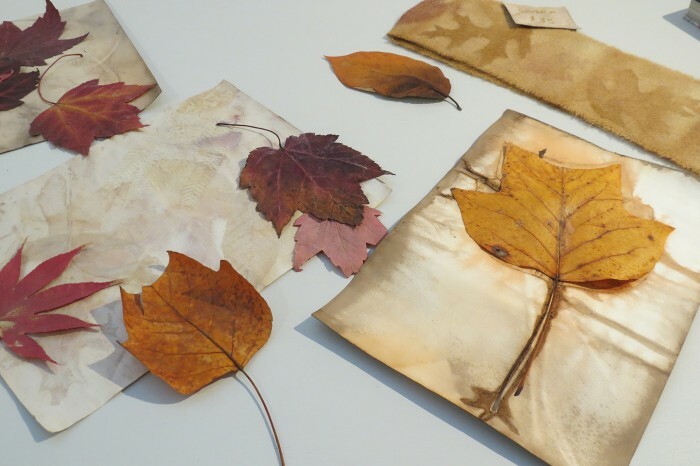 All of the textiles in Marion’s work are created by natural dyes obtained from plants. The dark color in this piece is particularly dramatic. 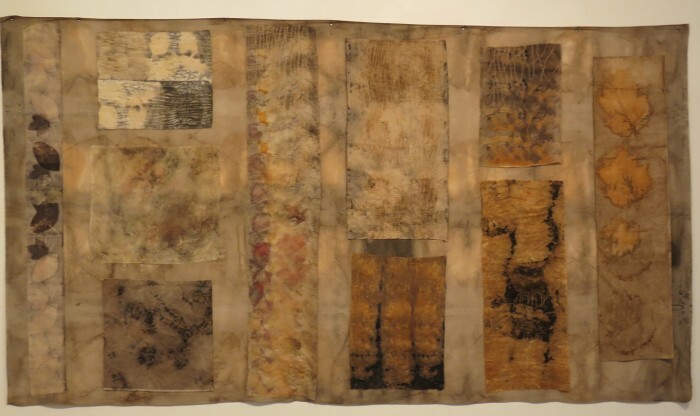 In this larger, sampler piece, the various techniques that she uses are evident. I hope that she has another exhibit when our tour visits Hamilton in April 2014 so others can also see her works. Thanks Marion, for being my New Zealand BFF! 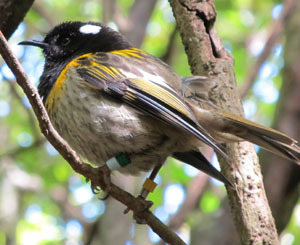 Wildlife and watching wildlife remains one of my passions. 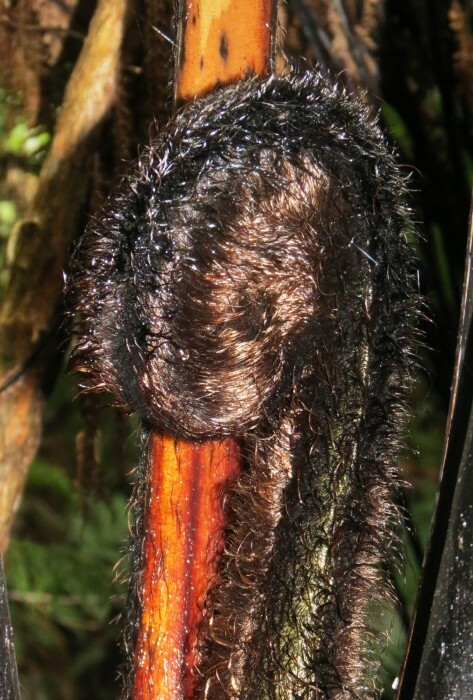 I clearly remember my very first sighting of a Pukeko, the iconic New Zealand bird. 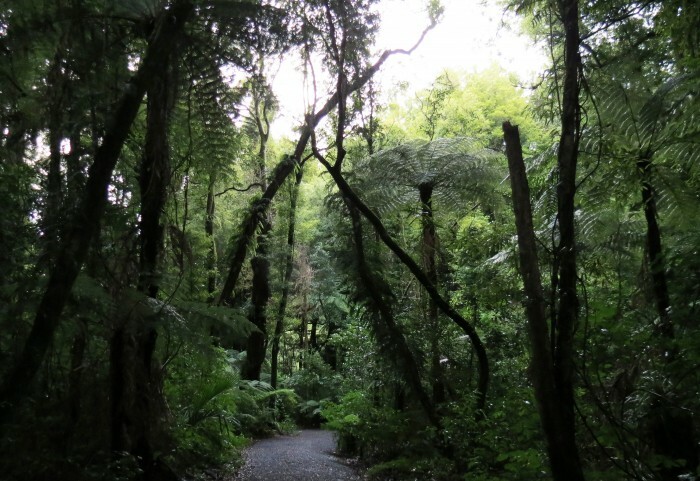 On this trip, I hadn’t seen any Pukekos and was concerned about where they go in the winter months. After all, it is a relatively small island! Then, when we were taking our morning constitutional walk around the lake near her home, there they were! In fact, they were everywhere, wandering around on the maincured lawns and foraging among the reeds! Yay! 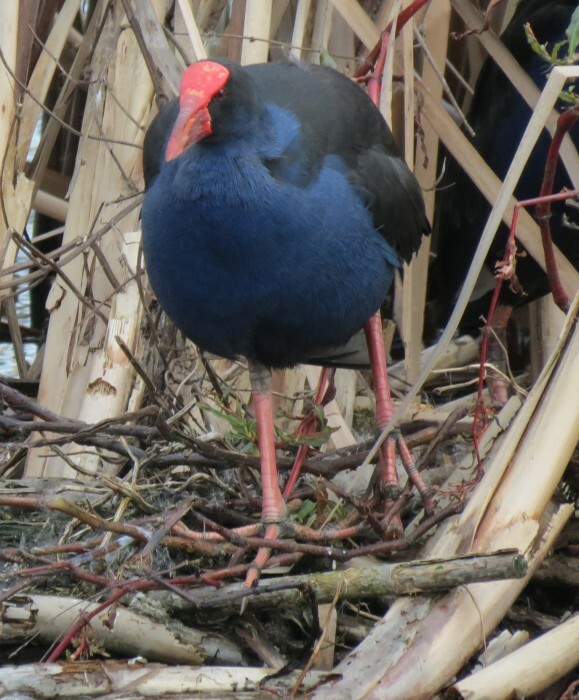 The trip would have been lacking had I not had another Pukeko interaction to take home with me! While Jean’s scarves were stunning, her large pieces were unbelievable. 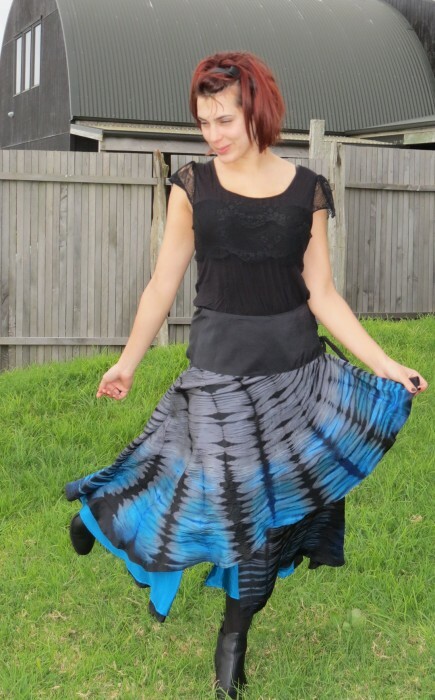 This turquoise and black silk wrap is just one of the pieces that Jean creates using ancient shibori techniques. Jean took us back into her dye studio and talked to us about her techniques. 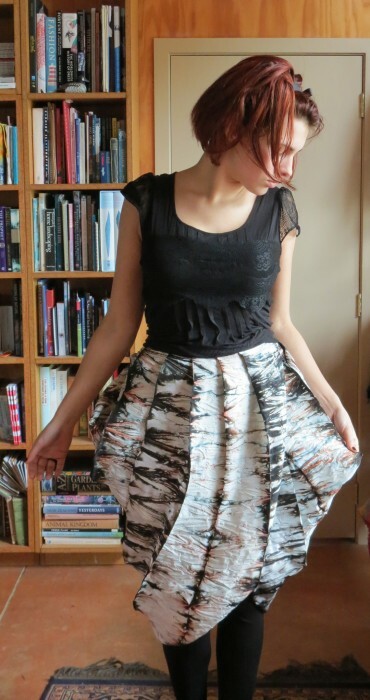 She not only works in silks, but also in other textiles. Above is a sample of other types of dying techniques that Jean uses. 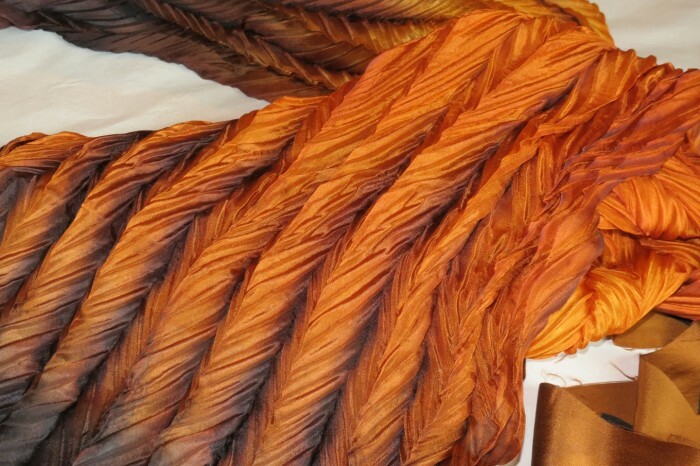 These are often made into garments and also a more rustic style of scarf. 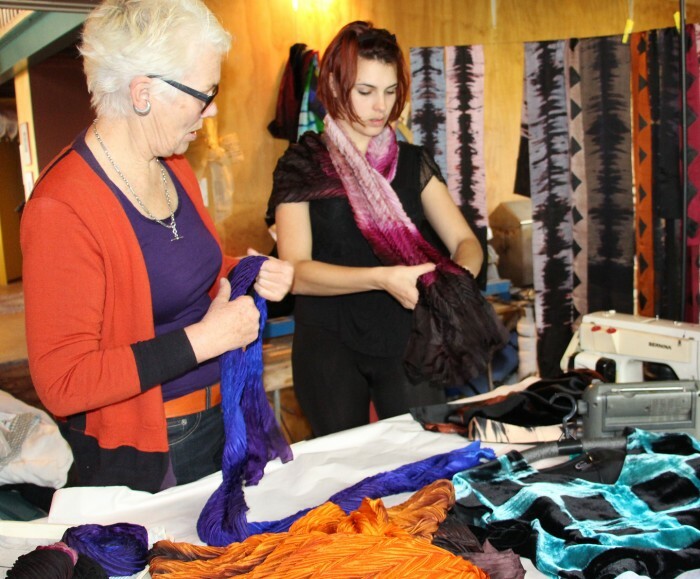 Although I’ve only shown images of Jean’s silk work, she also creates garments in velvets and other techniques. This will be an unforgettable stop on our tour next April. 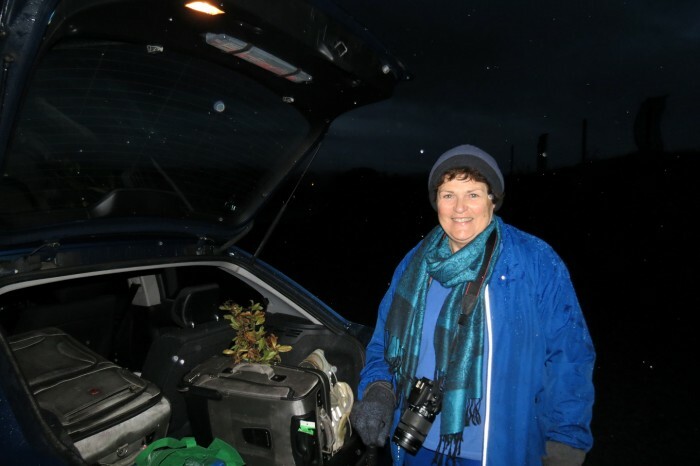 I know that you will enjoy her work and her studio as much as I did. 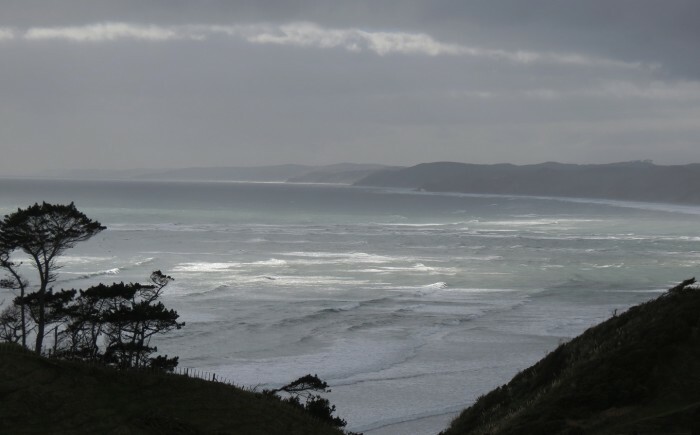 Next, Marion and I headed south and west from Hamilton to the small art community of Raglan, located on the western edge of North Island on the Tasman Sea. Our destination was the studio of Jean Carbon. 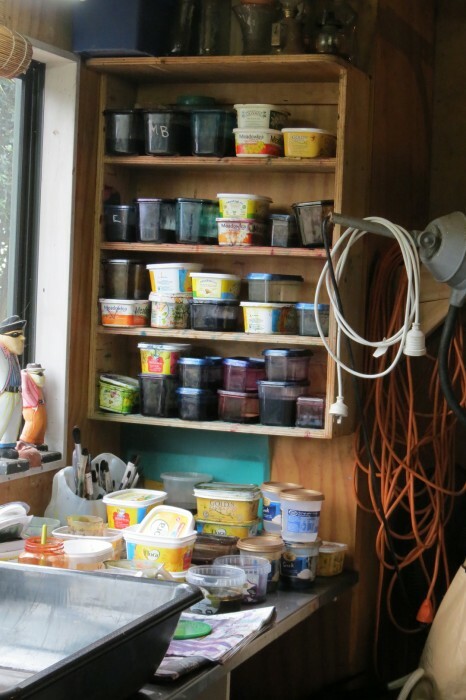 Jean is a popular artist who sells her shibori creations in boutiques throughout the country and this is the view from her studio. 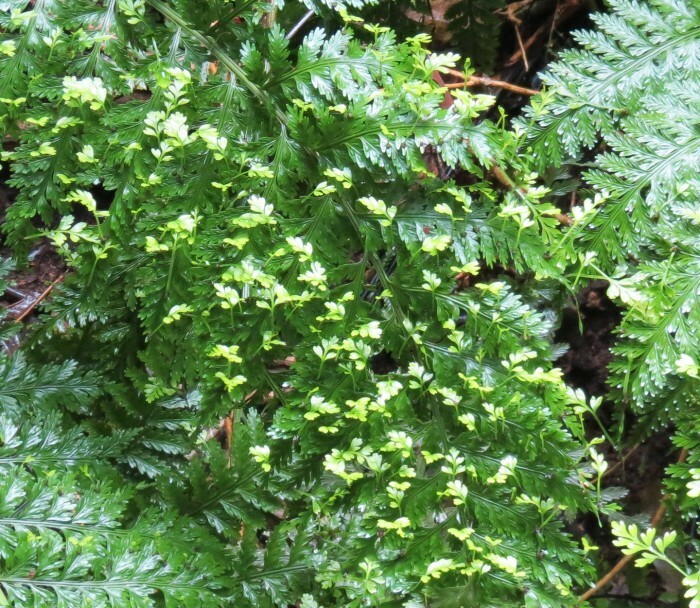 I first saw Jean’s work in a little shop in Queenstown on South Island. 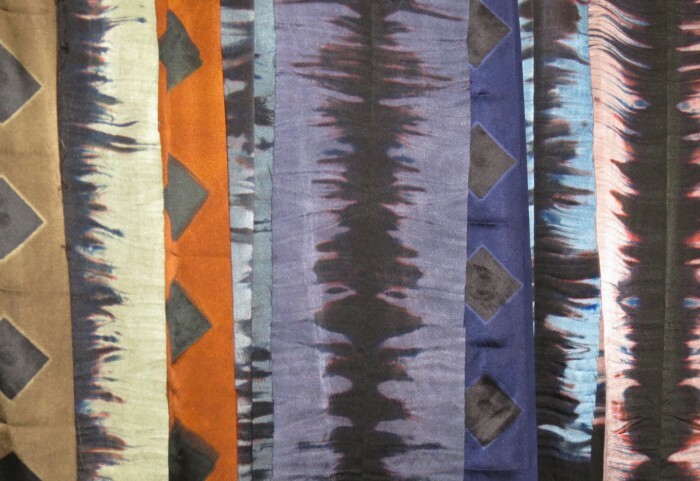 I marveled at the rich colors of the tightly folded scarves in the shop. The scarves virtually radiated saturated color. Oh, how I wanted to take one home with me. But here in New Mexico, my home, folks just don’t wear scarves. Dang! Jean says that fiber is her passion! 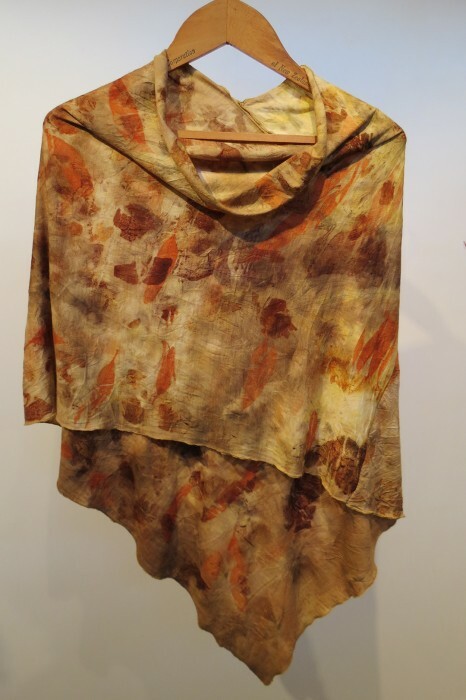 Her work includes sumptuous silks that are hand-dyed using ancient techniques to create garments and wraps that are timeless, elegant and totally original! Here, you can see how tightly rolled each scarf is, with only a small hint of the wonder that lies within. Watch as it unfolds. Simply amazing! The model is the French girlfriend of Jean’s son, possibly a young woman born to be a model. 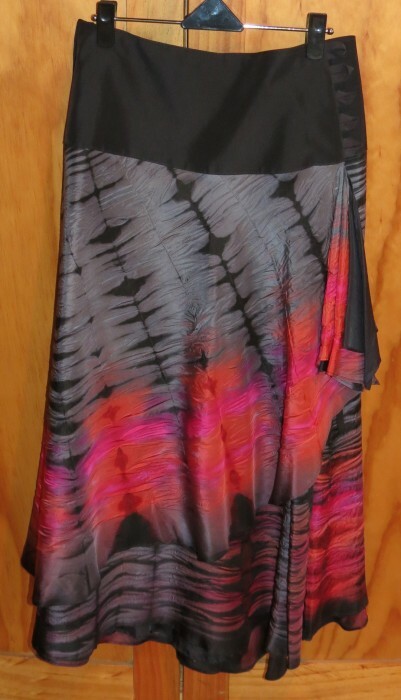 The shibori design unfolds as the scarf is opened. When draped around the neck, the colors virtually radiate, nicely framing the face. 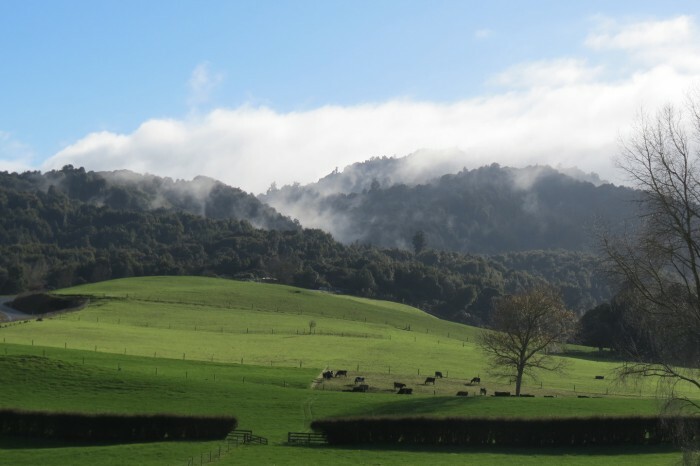 Jean’s Studio will be one of the stops on the Quilting and Textile Tour of New Zealand next April. Stay tuned for more of Jean’s work in the next post. Back in Hamilton, Marion and I made a quick stop at Donna’s Quilt Studio! 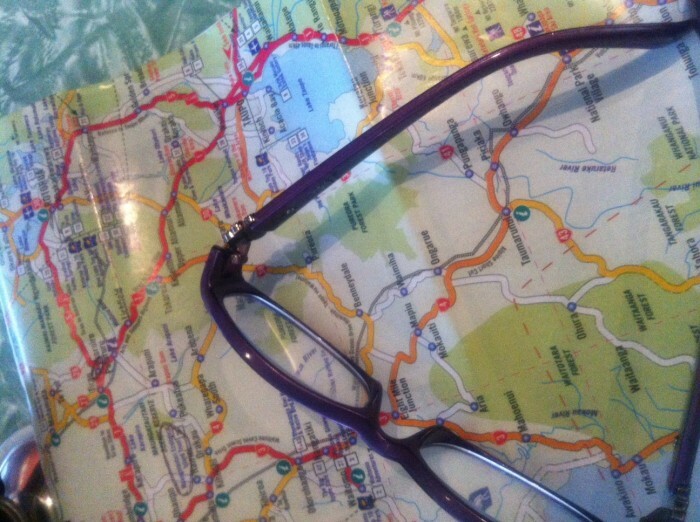 This is where we will be taking a 1/2 day class during my upcoming Quilting and Textile Tour of New Zealand. 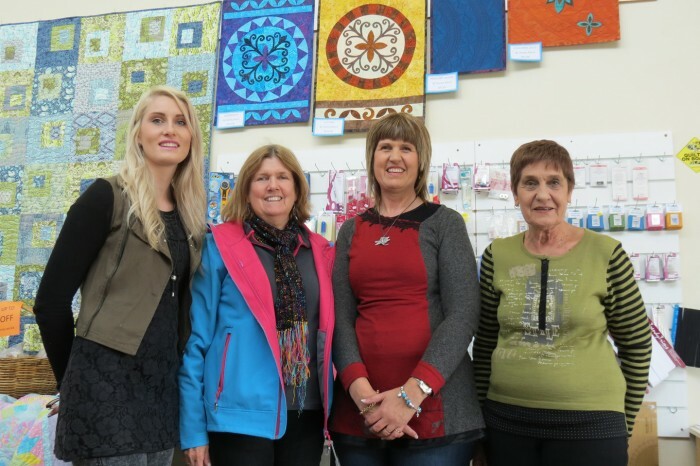 Owned by award winning quiltmaker, Donna Ward and her daughter Ashleigh, a visit to these old friends was a treat in so many ways. 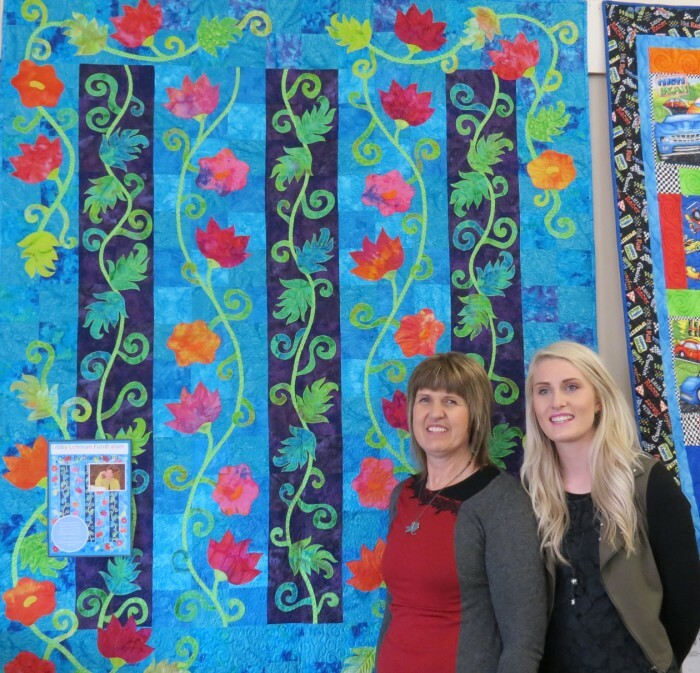 Above, Donna and Ashleigh show off the quilt they are raffling. The proceeds will go to help offset the costs of long-term rehabilitation for Libby Lehman, who suffered a stroke in April 2013. 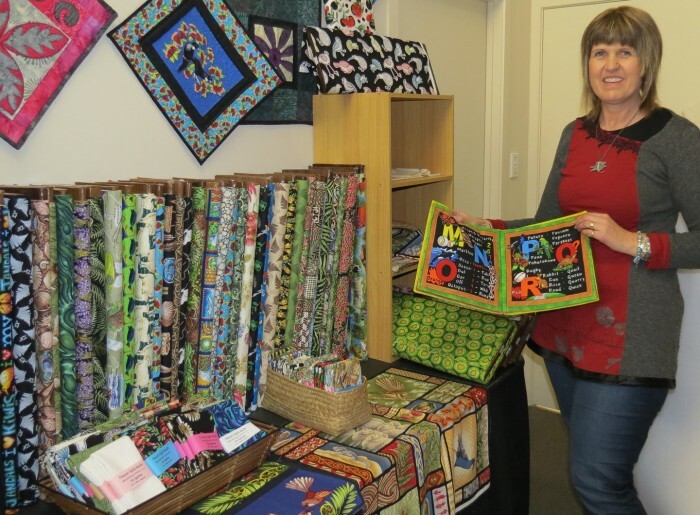 I asked Donna to show off some of the Kiwiana fabric that she sells. 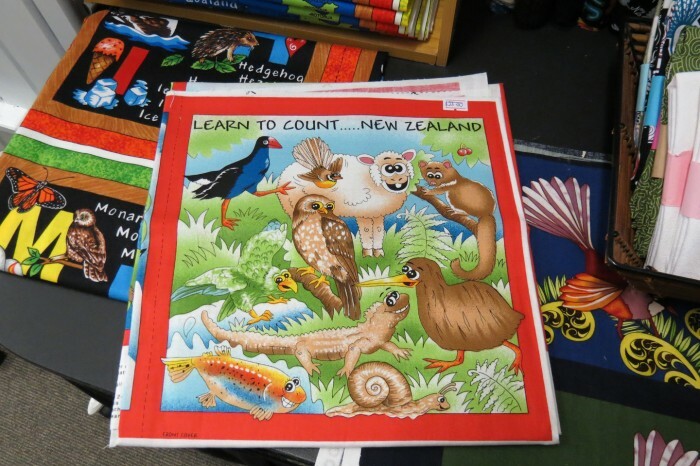 This fabric line features all the wonders of New Zealand in fiber, so that you can extend your memories of this great island nation. There is even a panel that can be made into a Learn To Count soft book for young children. 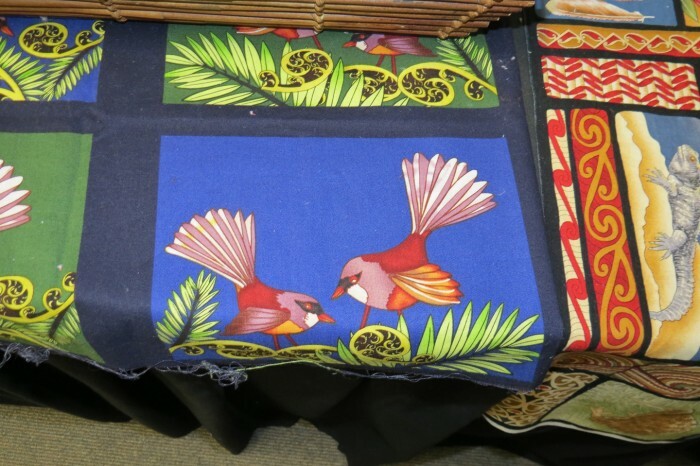 The Kiwiana line of fabrics includes a wide array of designs from traditional Maori symbols to native birds. 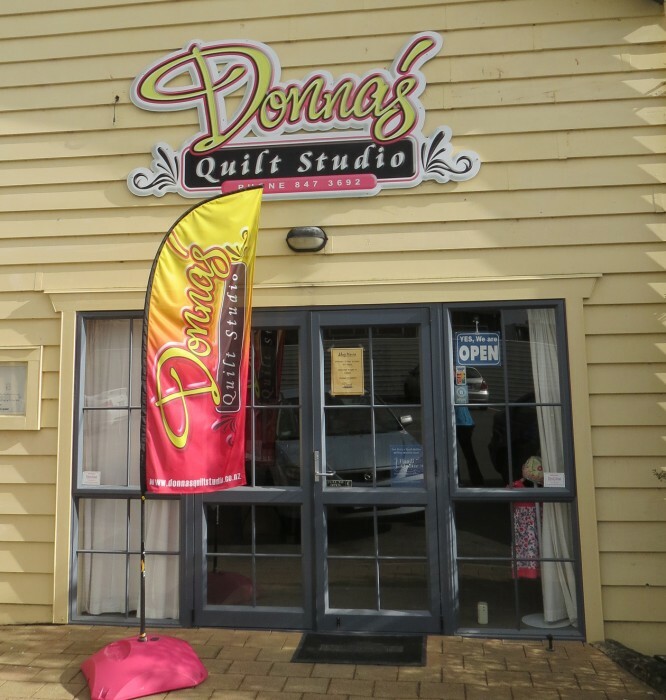 Donna’s Quilt Studio is a family affair with Donna at the lead, daughter Ashleigh, and Merle, her mom! I cannot wait to visit again in April 2014 with some of you and I can’t wait to see what Donna has in mind for our class! 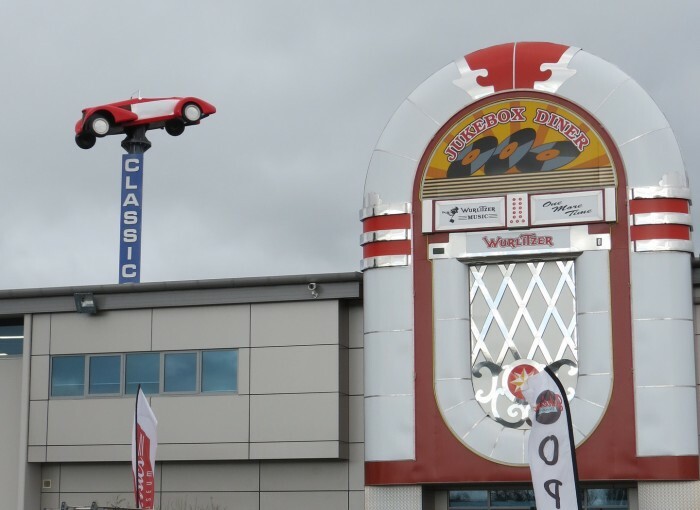 And, for the men who will be on our tour and possibly not interested in a quilting class, the Classic Car Museum is right next door! 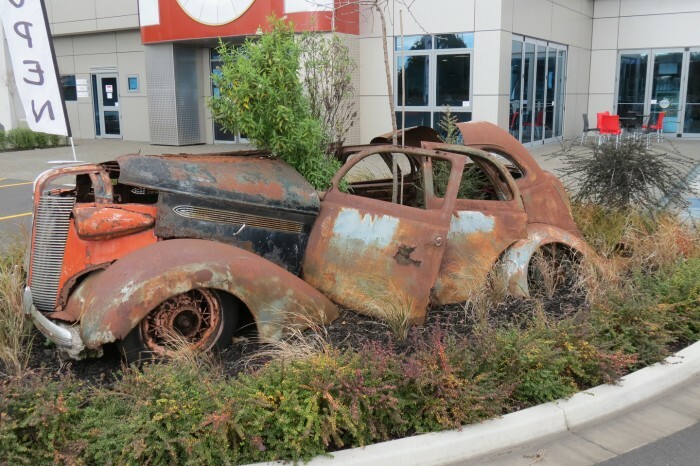 The vehicles range from this artistic alteration of a classic to the dream cars that are indoors! It’s the perfect way for a gent to spend the morning. I hope many of you will join me on this tour! We pulled into the driveway of Out in the Styx with enough time to unpack for the night and relax with our host, Lance, over a glass of wine. 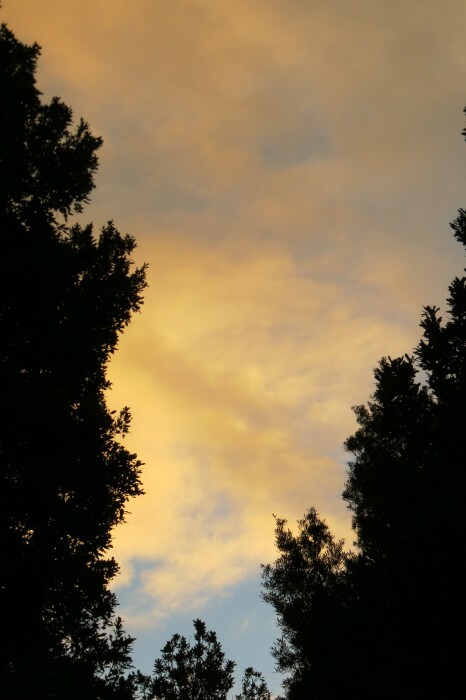 The clouds were hanging low over the mountain, threatening rain. It also was getting dark so our visit to the mountain would have to wait until morning. 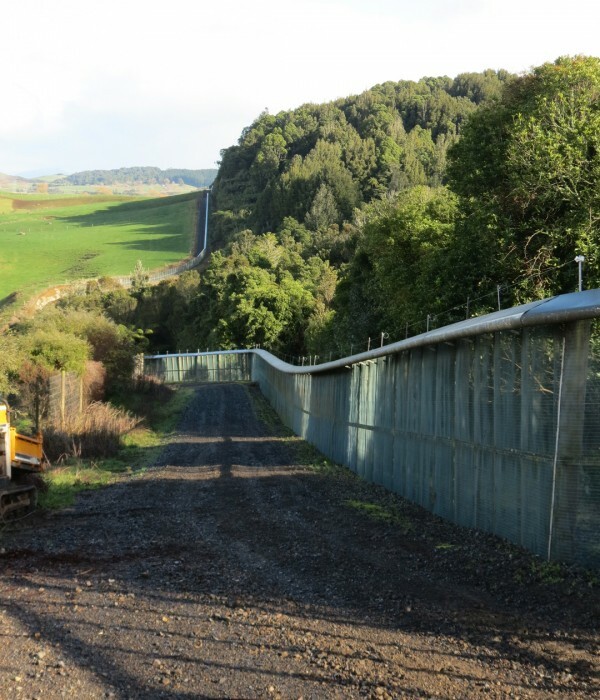 Lance regaled us with all the goings on over at Maunga, now called Sanctuary Mountain. There was a new visitor center, new birds, and new trails. While we remembered old times with Lance, and learned about more recent events, Mary was hard at work in the kitchen, preparing our dinner. It was . 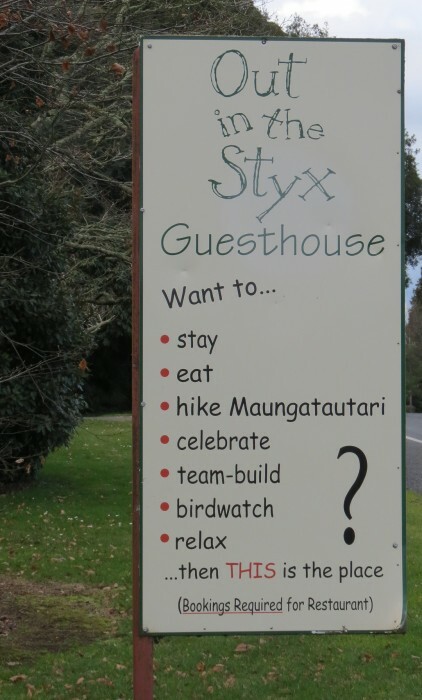 . .
Next time you are anywhere near the Waikato countryside, stop in! 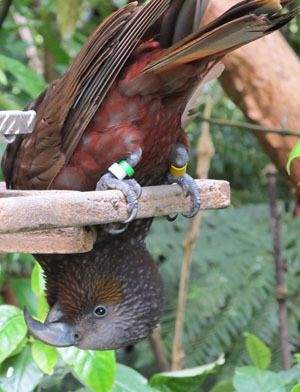 The food is impressive, the company entertaining, and the accommodations, right at the foot of Maungatautari Mountain very comfortable. Be sure to call for reservations first! Ciao Taupo! Hello Out in the Styx! Of course, my other favorite pastime is exploring back country byways. Marion and I headed north in the general direction of Cambridge. 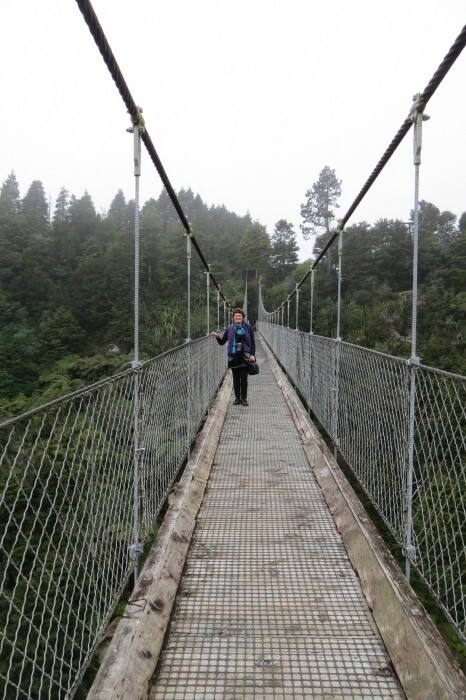 Along the way, Marion asked if I had ever walked on a swing bridge. Upon my negative answer, she quickly turned the car in the direction of the Arapuni Swing Bridge. 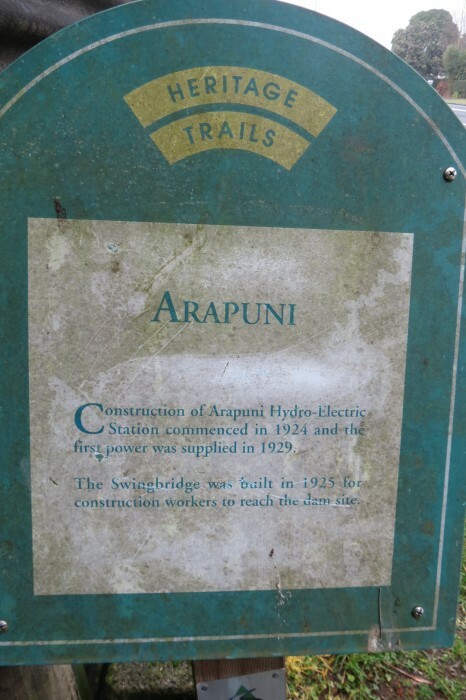 The Arapuni Suspension Bridge is located just downstream from the Arapuni Power Station on the Waikato River in the South Waikato District of New Zealand. 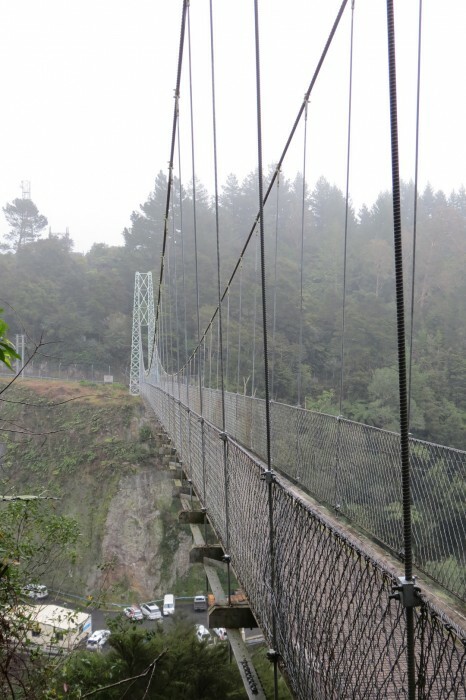 The 152-metre (499 ft) suspension bridge in the bush-lined gorge was built in the mid-1920s to allow workers from the village of Arapuni to access the power station construction site. It’s long way down to the bottom of the gorge! And, with every step, I could feel the bridge swaying. So, we did what any self-respecting tourist would do . . .
We took photographs! First of each other on the bridge, and then . 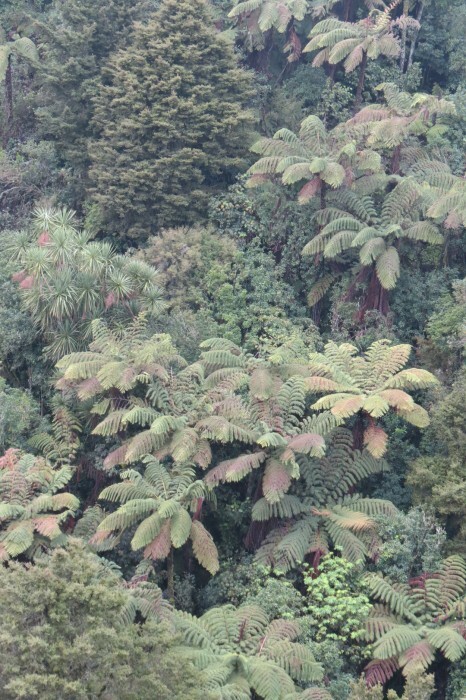 . .
and then, looking down at the giant silver ferns below! It was impressive! 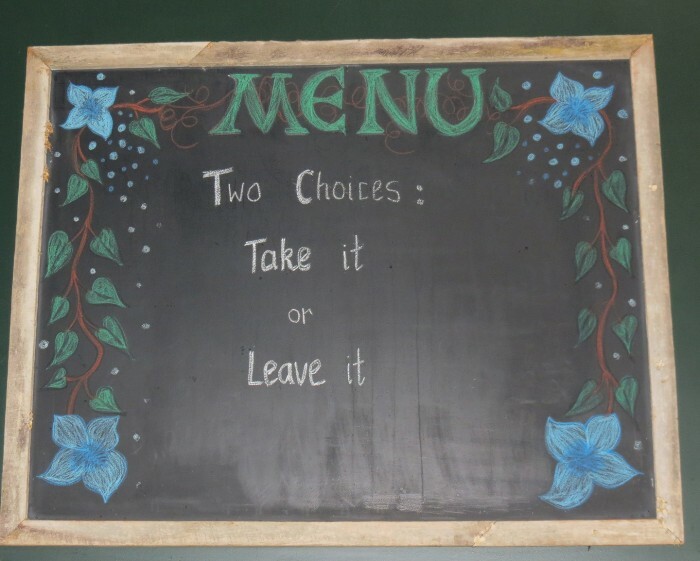 So impressive, that we stopped for tea right afterwards at the Rhubarb Cafe, a terrific local hangout! 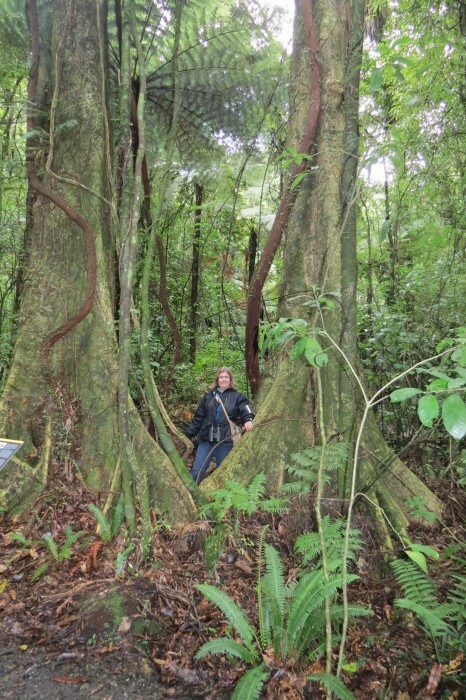 Soon we would be on the road again, heading for our stop for the night, Out in the Styx at the foot of Maungatautari Mountain, that incredible ecological preserve.